Trying to get a big rig unstuck can be a brutally stressful experience for any truck driver. If you drive professionally for a living, you can count on the fact that sooner or later, you’ll find yourself in this situation. I’m not referring to spinning out traveling up an icy grade or being jammed in a spot where the truck just won’t fit. I’m referring to getting your truck stuck in a snowy parking lot, or in soft sand or even mud. Getting a truck unstuck can be expensive too! If you find yourself in this unfortunate situation, there are 2 things you should do right away. Try to figure out exactly which of your truck wheels have lost traction. Try to determine what will solve your problem without doing any damage to the truck or the property. Here are a few solutions to get your truck unstuck. There’s one great perk I love about a manual transmission. 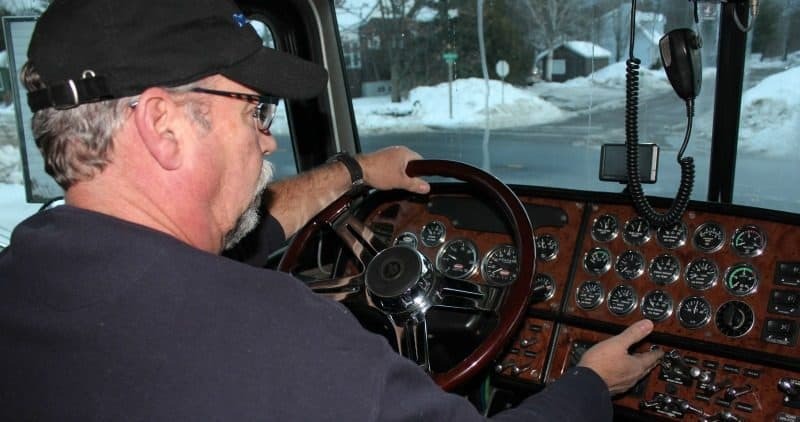 With a manual transmission and a little patience, the driver can get the truck into a rocking motion. This is done by engaging the clutch and giving the truck some fuel at the same time. By rocking the truck back and forth, you may be able to use the truck’s momentum to push the truck forward or back far enough to grab a spot where those wheels can regain traction. With the popularity of automatic transmissions and wide super single drive tires, it isn’t possible to so this. In the event that you aren’t able to get traction by rocking the truck, the next easiest way to get unstuck, is to be pulled forward by a tow truck. It will definitely be an expensive deal, but it will get you back on track with the least amount of damage. If you are stuck in the snow, you can chain up to get yourself unstuck. 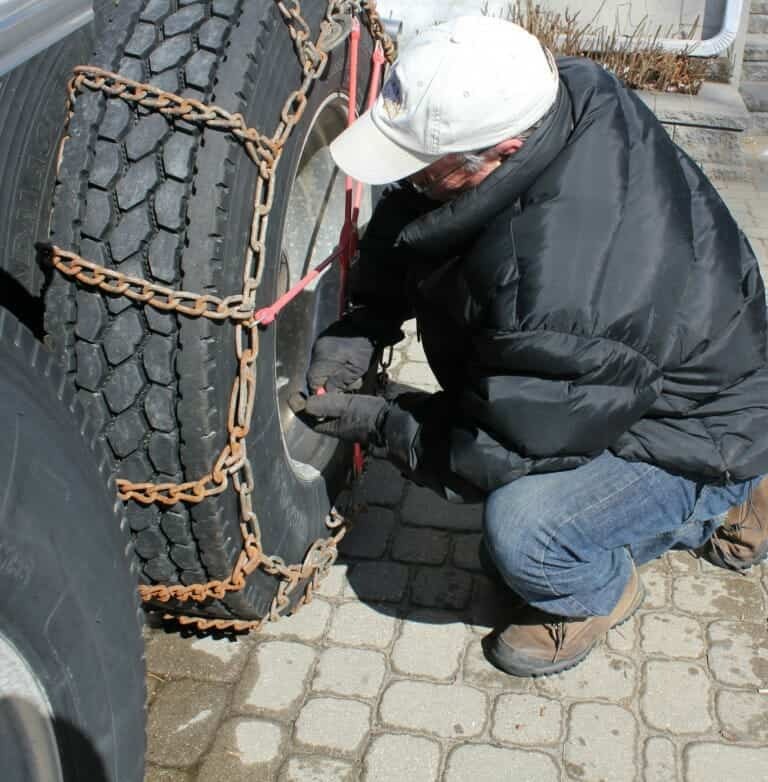 Keep in mind, tire chains will not work in the mud or sandy ground. It may sound silly, but it’s still the best way to approach this problem of getting your truck stuck. Avoid getting stuck period! Don’t take for granted in an unknown area, off highway, that the ground is stable. Get out of your truck and walk around and inspect the area. If the ground seems soft or very wet, don’t drive on the ground. Here’s a little trick will save you hours of aggravation on snowy, cold mornings. After parking your truck in a snow covered area for a period of time, for example at night, after about 10-15 minutes,after the tire rubber has cooled down, move your truck forward or backward from where you were first parked, into a fresh spot. Your truck tires hold enough heat even in the cold winter weather months to partly warm up the snow under the tires when parked. The snow under your warm tires will freeze and become icy. By letting your truck tires cool off and then moving the truck away from that icy patch you’ve made, you’ll avoid getting stuck when it’s time to fire up your ride when you’re ready to roll again.